It has been almost a year exactly since I went to Chicago to see “El Topo” at a midnight revival screening. I was excited about the trip, but nervous about how overtly obsessive it seemed to travel 5 hours “just” for a movie. Ultimately, I didn’t regret the experience one bit and Katie and I made excellent use of Chicago in the short span of our stay. Partly as a consequence of writing about “El Topo” and Jodorowsky’s later film, “The Holy Mountain,” I came into contact with Joe D of Film Forno and quickly became an enthusiastic fan of his blog. So when I heard that his feature film directorial debut was playing up near Chicago, it seemed like fate for Katie and I to take the journey north once more. Once again, we were not to be disappointed. Upon arriving in the city Saturday morning, we met up with my good friend Derek. Derek was my roommate for two years (including at the time of my first trip to Chicago) and currently studies law at the University of Chicago. He took us to a little local restaurant called Orly’s, which just happened to have the greatest French toast ever (brown sugar batter as thick as a funnel cake!). They also served a medley of regular, curly and waffle fries with every meal and dished up a scrumptious bbq sandwich that nearly compared to my youthful years in Kansas. We visited the Museum of Science and Industry (which could more accurately have been called the Museum of Science and Industry and Fairy Castles) and did everything from turning exotic gears (A major highlight. This is not as lame to gush about as you would think.) to cooing over freshly-hatched chicks. Both science and industry held their own, but the Fairy Castle would have to be my dark horse winner. Afterwards, we drove by the Robie House, an residential architectural masterpiece by Frank Lloyd Wright that I had wanted to check out. Derek, being an open-minded film fan himself, joined us on a short hop over to Lake County for the film festival. After some confusion with the venue, we found our way to the screening. A deadpan Jarmusch-esque short, “A Perfect Place,” preceded the film. 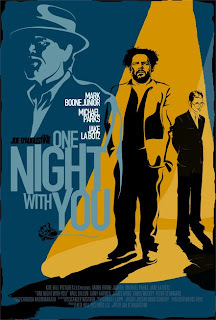 It shared star Mark Boone Junior with the main showing, “One Night with You.” Joe’s feature is a mix of dark comedy and modern noir with a sharp eye for dialogue, timing and character. It got quite a few genuine laughs from the whole gang and we all roundly gave it our thumbs up. It should be in theaters or available on DVD soon. After the film I introduced myself to Joe and his wife/producer Heather. I’d previously kept my coming a secret, implying that I wouldn’t be able to make the trip when he first announced the screening. Our first in-person encounter went quite well, and we all found ourselves sharing dinner and talking late into the evening. Evidence continued to abound that our tastes coincide and I look forward to seeing more of Joe’s work in the future. You can read Joe’s post about his stay in Chicago and see his photos of SuperDawg and of us (Heather is holding the camera) here. Katie and I set out on our return at about midnight and made it in around 5:30 am Sunday. After some much-needed rest, it was time to go out to the theater and check out “4 Months, 3 Weeks and 2 Days,” further verification that we are in the midst of a Romanian New Wave. I'll be gone all next week due to Spring Break - I'm driving up to visit Shannon. Next time we meet up, remind me to talk about two things: math and Claude Shannon. I am John Mora and I endorse this style of writing.